Tonight we are at the Westfield KOA, NY. We took our time today and by the time we got this far it was just too far to go to get home at a decent hour, so we stopped in at this lovely site on Lake Erie. This is the end of this adventure — we should be home tomorrow afternoon. We left Pigeon Forge after lunch on Monday and got as far as Renfro Valley, Kentucky before stopping at the KOA.The drive was hot and uneventful, as was the next day, when we drove through to Columbus, Ohio. The traffic was heavy when we arrived in the outskirts of the city and there were some very rude drivers on the road. When we were driving in the right-hand lane, passing an exit ramp, a woman in a van to our left suddenly decided she was going to go off at that exit. She pulled in front of us and stopped dead in our lane because the exit ramp was already full. She waved her hands at the driver of the car beside us, motioning him to back off and let her in! What nerve! It’s a good thing that Jim had already slowed down to a crawl because of the already slow moving traffic (turned out that there was an accident up ahead, causing the jam). So many people don’t realize the weight of a 32′ motor home, pulling a bike on a trailer. We can’t stop on a dime! We enjoyed a great meal at The Cracker Barrel and didn’t feel like going any further, so with the permission of the manager we set up for the night in the parking lot. There was some shade and we were the only ones in the large lot after the restaurant closed at 9:00 pm. At 9:30, just when we were thinking of going to bed, a semi pulled up right beside us, left his engine running and his lights all on, including his signal lights, and crawled into his sleeper cab and went to sleep! If you’ve ever been parked next to one of these for any length of time, you know all about the many loud noises they make. If he had to nap there, could he have not at least had the consideration to go to the other side of the lot? We debated about pulling out and trying the Walmart lot instead, but I was too tired. We were thankful to hear him leave an hour later. 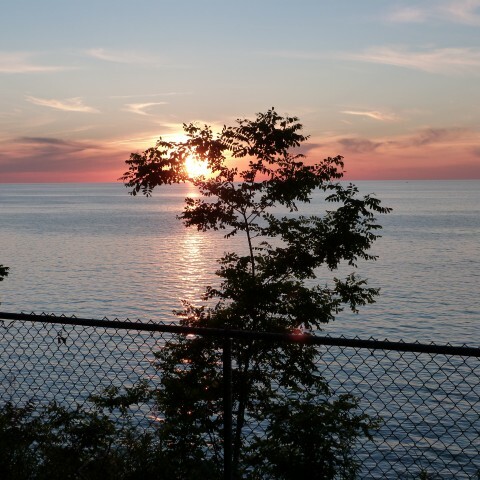 Tonight, after a dinner of left overs, we took a walk to the park across from the campsite to capture some pictures of the sunset over Lake Erie. 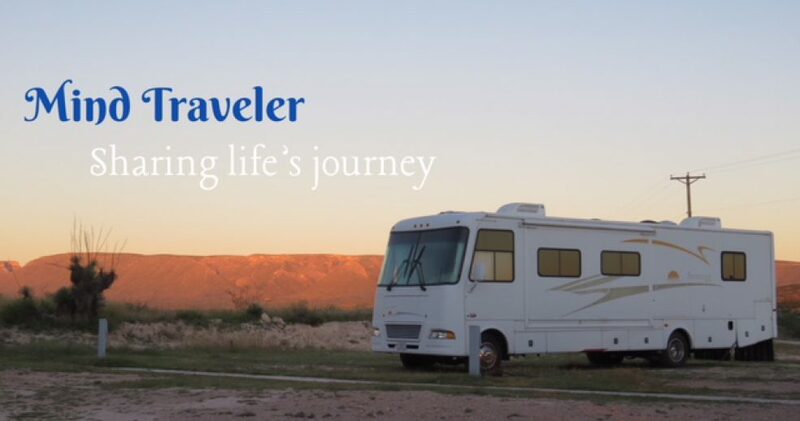 This entry was posted in Motorcycling, RV Travel, Travel and tagged bikes, Columbus, Cracker Barrel, KOA, Lake Erie, motor home, Ohio, RVing, Sunsets, travel, Westfield NY. Bookmark the permalink. 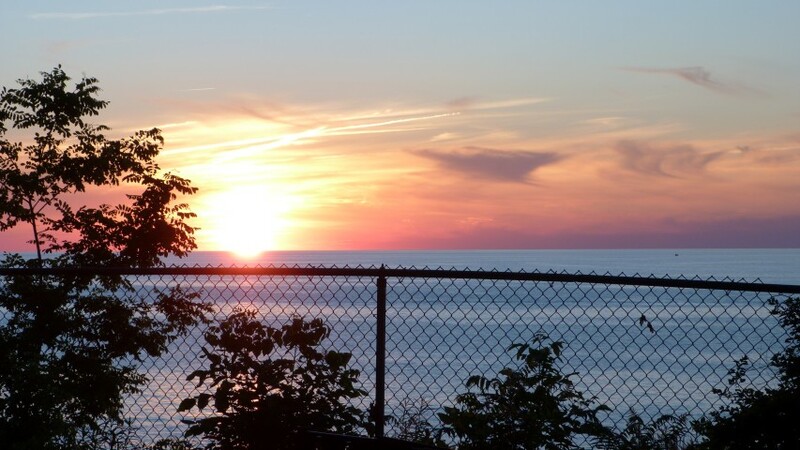 Beautiful sunset indeed!! But what inconsiderate drivers you encountered with the woman butting into your lane and the rig driver who was equally self-centered. We too ran across such rude people in our travels years ago, so I could feel your frustration. Fortunately, you were alert and averted a mishap — we also were lucky. Welcome home.